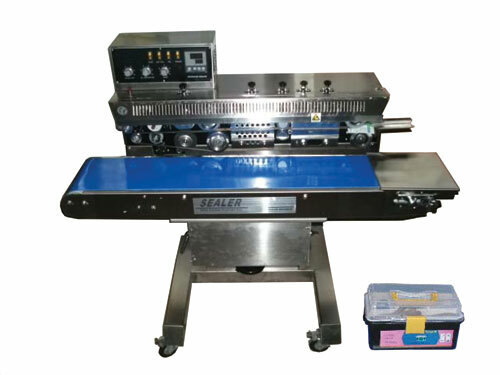 This sealer comes standard with Code Printer and Built-in Conveyor. The Tilting Seal Head feature allows tilt up to a 30-degree angle, which makes this sealer ideal for most any produce including those with some liquid in the package. It has a full range of adjustments on both the stand and conveyor. Temperature is controlled by a solid state controller for consistent seal quality regardless of throughput. 39" x 17" x 13"